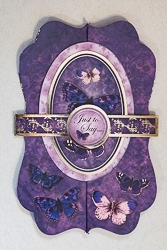 Handmade butterfly duo-spinner "Just to Say" greeting card is beautiful and unique. Front panels open/spin out to expose the inside sentiment panel and is free-standing for display. Belly band keeps the card closed until taken off to open up the card. 3 3/4" by 5 3/4" when closed with gold foil accents. Note: Available in quantity of one.